The foreign exchange market is the biggest financial market as it makes more than $5 trillion traded value daily. As there is no central place to have this trading activity. Therefore, it is necessary for the traders to find out brokers who can conduct all trading and financial operations on their behalf. For this, the traders are willing to pay high fees to the brokers but all what they need is to hire a good broker. As it is obvious that Forex brokers play a significant role in the success of any trader But currently, it is a great challenge to select the best broker as there are a large number of brokers in the market. There is not a hard and fast rule that must be applied to search the most deserving Forex broker but still there are some ultimate tips with the help of which the trader can find the most capable Forex broker in town. The first tip is to make the list of all available brokers but the trader must make sure to include only those brokers who are registered with any regulatory authority. The basic purpose of these regulatory authorities is to protect traders from the public fraud, unethical acts, abusive practices and manipulation of the financial market and to provide a safe and competitive environment to conduct all trading activities in a financially sound market. These authorities also make sure to only provide those brokers that meet all the legal operational standards and rules of trading business . The selection of regulated Forex broker increases the possibility of hiring the most reliable broker. 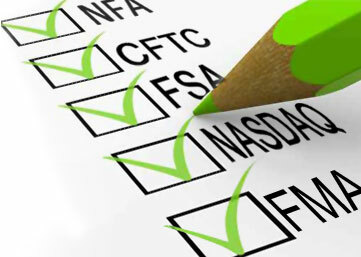 The most common regulatory authorities are CFTC and NFA in US, FSA in UK and SFBC in Switzerland. The trader must consider different types of account offerings by the brokers. It includes what amount of leverage is offered by the broker such as 200:1 or 50:1. This is essential as the right level of leverage can increase the profit of the trader and wrong level can destroy his account very badly. Also, the trader must give attention on the percentage of spreads and commissions asked by the broker. Some broker prefers to take no commission as they are interested in working on a wider spread during trading. In addition to leverage and spreads, the trader must also consider the level of initial deposit of a broker and ease of withdrawal and deposit with that particular broker. The trader should analyze all the possible currency pairs offered by the broker. The major currency pairs are EUR/USD, USD/CHF, GBP/USD and USD/JPY. In the last, the trader must analyze the customer support service of the broker. The trader should check that how he can contact his broker? Is there 24/7 customer service? How much the broker is open to listen question and complaints? And how much the trader has to wait for order execution? After going through all these steps or tips, the trader can have a clear picture that which broker he must select for his Forex Trading business. Basically regulated Forex broker is preferable to hire as it is regularly audited and monitored according to a given set of rules and regulations dictated by the regulatory agencies. The broker has to fulfil all the requirements to be an active broker and remain in the business of trading. These legal requirements are provided by the regulatory authorities. The broker has to maintain a specific amount of deposit so that he can deliver quality services to his clients without any delay and disturbance. Also, he has to follow all the operational standard to maintain his position. It is also essential for the regulated Forex broker to make a transparent relationship with his client by showing all important information regarding his financial documentation and other financial accounts. And for this, he has to give his weekly financial reports to the authorities. It is extremely vital for the broker to complete all the requirements of the regulatory authority otherwise he has to face a huge financial penalty or even sometimes there is chance that he can get terminated from this profession completely. It is quite beneficial to have a regulated Forex broker as regulations make sure to satisfy clients financially and as well as to provide them excellent services so that they can find a secure place in the Forex trading business. One of the most important advantages is that the client of the regulated Forex broker has his deposits secure as it is usually placed in a separate bank from the normal company fund. It means that the broker cannot use the money of his clients in any of his financial activities. This regulation not only make a customer feel financially protected but also allows traders to make a legal complaint of the broker if he use any fund of the trader for his personal use. The regulated Forex broker is also responsible to meet standard in all his operations including the intensity of customer service support, the monitoring of clients’ accounts and making quick strategies to minimize the risk while maximizing the profit. The traders can easily find out the regulated Forex broker because most of them mentioned this feature on their official website. Also, they can also verify the broker’s status by checking the active members list of the Regulatory Authority official website or office. It is a matter of great concern for new traders that how to find a reliable Forex broker. It is obvious because no one can give his huge amount of capital to any unknown person just to start his trading business in the Forex industry. The traders are quite worried about how to select the perfect Forex broker as there are so many brokers in the market who are claiming their outclass services to the traders. In addition to this, they are also offering different bonuses, promotions and much more that makes a newbie trader confuse about how to take a rational decision for the selection of a broker. Most of the new traders have a wrong perception that a broker who is having his own official website that has a feature of currency trading, 24/7 customer support, good page rank and contains a trading softwares is better than other brokers. These attributes does not guarantee you a successful broker. New traders must give full attention to be aware of fraud in trading business. Unfortunately, Fraud is a very prominent feature of the trading business and it is very difficult to rely on on any employee, trader or a broker completely. There is only one way with the help of which the trader can minimize the possibility of having fraudulent broker and that way is to hire only regulated Forex broker who is an active member of the regulatory authority of his country. This membership ensures that the broker is legally monitored and audited by some official agency . The regulatory author institutions are different in various countries as they depend on the geographical location of the broker. The trader has to make sure that his broker is registered with the right regulatory authority. In the United States, the two regulatory agencies working in the trading business are NFA and CFTC. The NFA dictates the rules and regulations of specific capital requirements and protection of a certain financial system by all its broker members. On the other hand, the CFA is responsible in making rules regarding the maintenance of the commodity brokerage industry, how to protect traders from fraud and unethical acts in trading commodity, financial futures and options markets. In Australia, the Forex regulation is made by ASIC which is Australian Securities and Investment Commission. All the legal Forex broker in Australia has to get membership with this authority and also it is compulsory for every broker to have an Australian Financial Services License. In Switzerland, the major regulatory authority that runs all trading activities is SFBC which is the Swiss Federal Banking Commission. In addition to this, there are other private firms also but the new trader must make sure to only choose that broker who is the member of the SFBC. In U.K, the rules and regulations of Forex broker are dictated by the Financial Services Authority or FSA. This agency is responsible to make sure that the broker keeps his capital separate from his clients’ fund and the broker must not use any deposit of customer for his personal use. How to start trading business and avoid forex trading mistakes ?